TestoTEK is a so-called ‘testosterone booster’ supplement made by a company called TEK Naturals. If you’re looking to find out everything there is to know about TestoTEK then you’ve landed on the right page. We’re going to be taking a very close look at this supplement from all angles to see whether it can live up to the hype, or if your money would be better spent on something else. 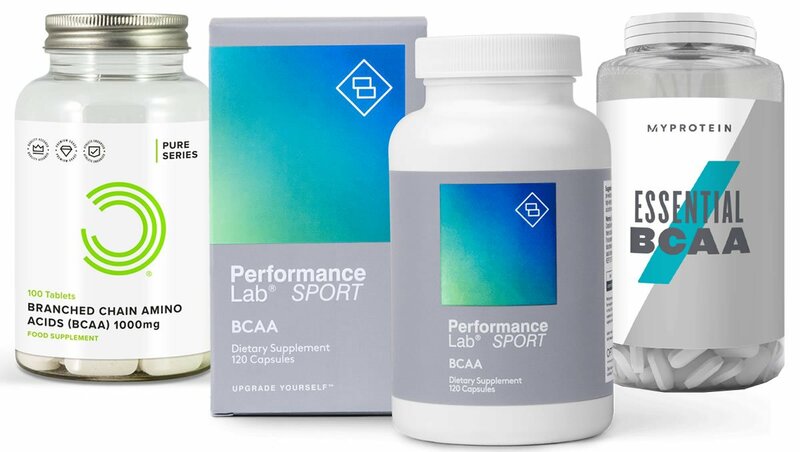 The sports supplement market has grown incredibly rapidly in recent years, and that means more choice than ever when it comes to picking a product in this category. However, the extra choice also means that it’s significantly harder to actually pick out the best product. 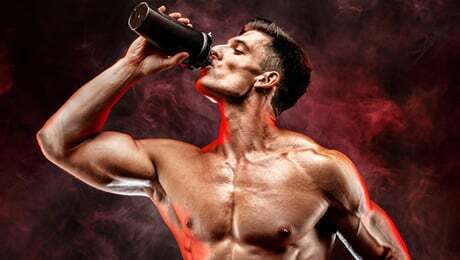 Our TestoTEK review is going to focus on all of the key things that you need to know about this particular supplement as we look to see whether it deserves a spot on our list of the very best testosterone booster supplements on the market right now. 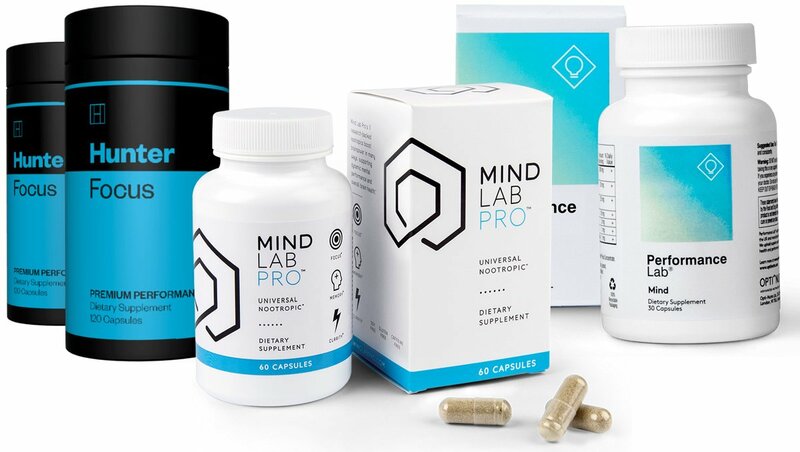 We’re going to pay particular attention to the ingredients formula, the customer reviews and the dosages as we look to see exactly where this product stands in comparison to the competition. So, let’s not waste any more time and start taking a close look at TestoTEK to see if this product can live up to the hype or not. So, we’ve clearly already worked out that TestoTEK is a popular ‘testosterone booster’ supplement made by TEK Naturals. You’ll find TestoTEK on Amazon, as well as the official website. It currently costs around $69.99 for one bottle, which makes it one of the more premium-priced supplements in this category. 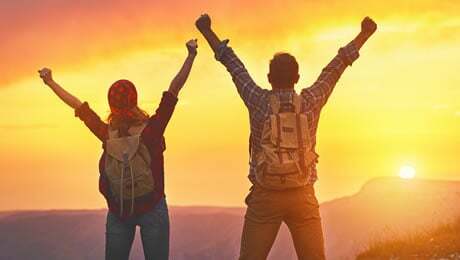 In case you didn’t already know, TestoTEK fits into a category of supplements that usually contain a range of natural ingredients that can help to support you. The official TestoTEK website says that taking this produce will help you to experience an “amazing transformation”. The TestoTEK bottle says that taking this supplement will bring you a number of benefits, including “Strength and Performance”. 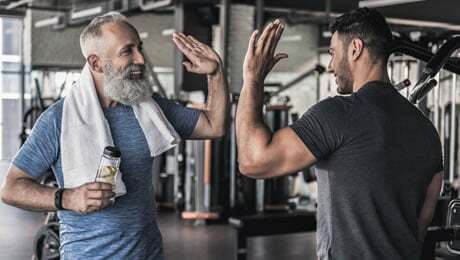 The official website describes TestoTEK as an “all-natural supplement that uses 12 powerful ingredients” to help you hit your goals. It also claims that it will “safely and effectively” work and with no side effects. This all sounds pretty good so far, but we’ve learnt not to pay too much attention to the marketing hype surrounding supplements. Instead, it’s better to focus on the important facts such as the ingredients formula and the dosages. With that in mind, let’s now focus on the next important section of our TestoTEK review – the ingredients. Let’s kick off this part by taking a close look at the actual TestoTEK ingredients formula as printed on the bottle. Firstly, it’s good news that TestoTEK doesn’t use a proprietary blend. This means that we have been clearly told all of the dosages of the ingredients. This is good to see. 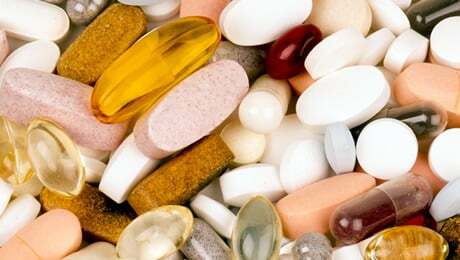 Many supplements on the market these days use proprietary blends to hide the doses of the ingredients they use. This is never good, as it means that you don’t actually known the individual doses, so it’s good that that isn’t the case with this TEK Naturals supplements. Let’s now take a closer look at each of the ingredients in the TestoTEK formula. • Vitamin D3 – Vitamin D is always a decent inclusion. You probably already know that our bodies naturally produce Vitamin D when our skin is exposed to direct sunlight. But it can be difficult to get enough of it all year round. • Vitamin K – Vitamin K is an essential nutrient that your body needs in order to be able to function properly. You can get it from your diet, but supplementing with it is also an option. It’s a decent inclusion in the TestoTEK formula. • Zinc – An essential mineral that your body needs in trace amounts in order to be able to function properly. Zinc plays a key role in a number of bodily processes. In case you didn’t know, Zinc is known for contributing to the maintenance of normal serum testosterone levels. • D-Aspartic Acid – This is our top-rated ingredient. D-Aspartic Acid is one of the few ingredients out there we really like to see in this kind of supplement. The 2000mg dose is OK, but we would have preferred to see a dose closer to 3000mg. • Mucuna Pruriens – Also known as Velvet Bean, this is also one of the main ingredients in Prime Male. It’s thought to be a good source of L-Dopa, which is the precursor to Dopamine in the body. • Stinging Nettle Root – This is a common ingredient. However, there is not too much evidence to suggest that it will actually be able to help when it comes to a supplement of this type. • Fenugreek – A good ingredient. As well as being a good source of Magnesium and Zinc, Fenugreek has shown promise at being able to help with a few things, and so we like to see it used in supplements of this type. • Oyster Extract – This is one of the main ingredients in the TestoFuel supplement. It’s a very good source of Zinc, which we’ve already singled out as a good ingredient. • Siberian Ginseng – Ginseng is well known as an ingredient that is commonly used in lots of different supplements and also sold alone. It’s not a bad ingredient. 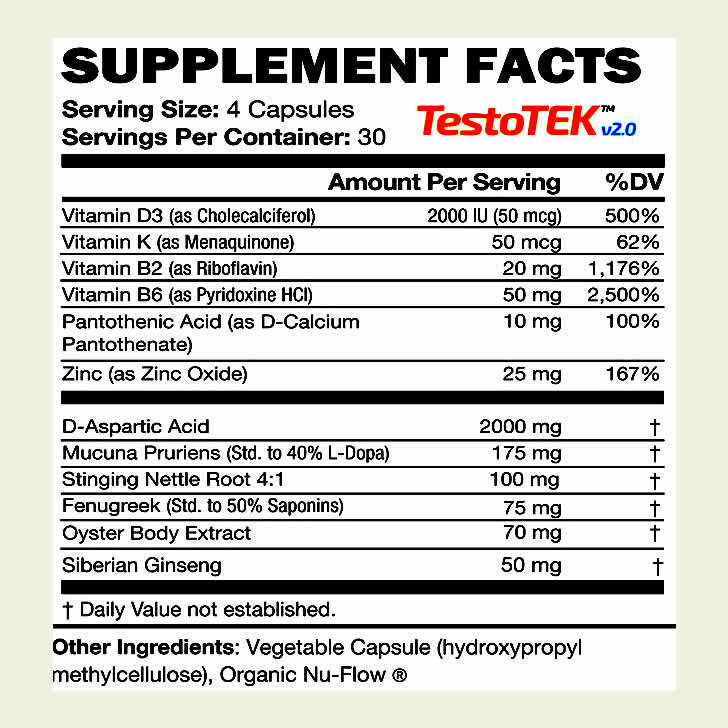 The TestoTEK formula is actually pretty good, at least compared to a lot of the supplements we’ve reviewed recently. Magnesium is an important essential mineral which contributes to the reduction of tiredness and fatigue and normal protein synthesis. Boron is a dietary mineral that we like to see in supplements of this type. Meanwhile, Black Pepper Extract could help to boost the absorption of the other ingredients in supplements to make for a more effective product overall. 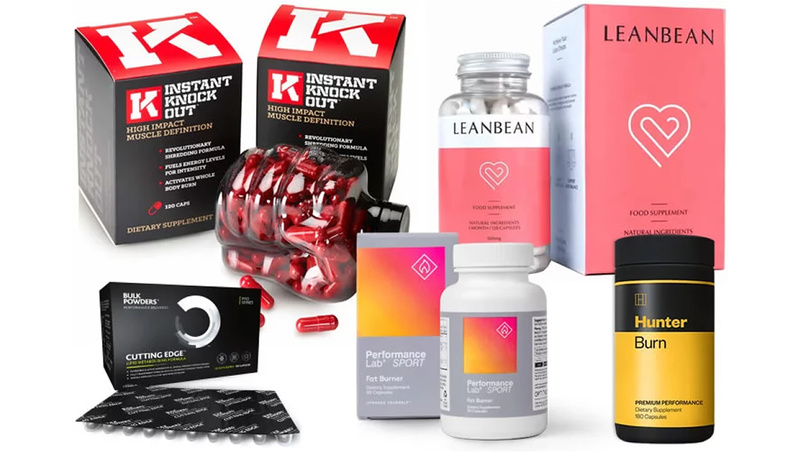 You can see our updated guide to the leading supplements on the market at the moment by following the link shown below. The TestoTEK website proudly proclaims that this supplement won’t cause any side effects. But the truth is that you should always do some of your own research into the ingredients before thinking about trying any new supplement for the first time. It’s always a good idea to consult your doctor before trying any new supplementation for the first time. Each bottle of TestoTEK contains 120 capsules, which is the same as a 30 day supply. The directions say that you should take four capsules per day. At the time of writing, TestoTEK had 67 review on Amazon, with an average rating of 3.2 out of 5 stars. One person rated it five stars and said that it had quickly helped to increase their energy levels and endurance after having taken it for three months to begin with. However, another person said that they had been taking it for three months and they hadn’t notice any difference at all. TestoTEK is not bad, but we don’t currently rate it as one of the very best supplements on sale right now. That’s because it’s missing some important things such as Magnesium, and things such as D-Aspartic Acid are slightly under-dosed for our liking. 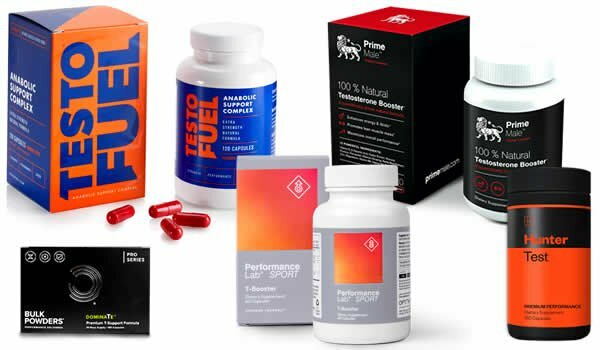 You can see our updated guide to the very best supplements in this category on sale right now by following the link shown below. Just remember that there is no ‘magic pill’ when it comes to achieving your goals. You should always remember that making sure that you’re sticking to a healthy diet, training hard and getting plenty of rest should be your priorities if you’re looking to get into shape. That being said, a high quality supplement can help to support your goals if used in the correct way. That brings us to the very end of our TestoTEK review. Overall, we rate this supplement as an OK product. It’s good that it doesn’t use a proprietary blend and also has some decent ingredients such a D-Aspartic Acid and Fenugreek. However, we don’t quite rate it as one of the best products on the market right now because it’s missing some key ingredients and things like D-Aspartic Acid are slightly under-dosed. The TestoTEK reviews on Amazon are also not that impressive either.